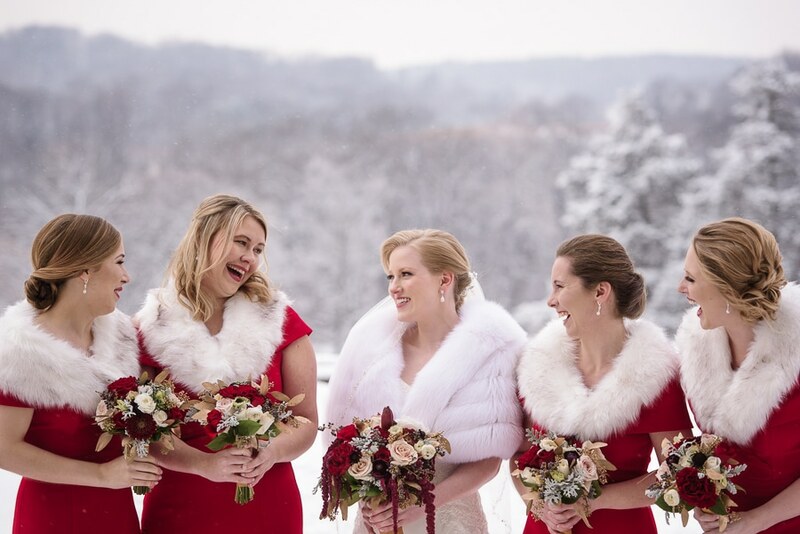 Madeline and Maxwell’s Cairnwood Estate wedding was a snowy day adventure! When I picked my assistant, Katie, up at 7:30am on a snowy Saturday morning we both just smiled. The forecast did not call for that much snow, but we knew it would make for a picturesque day for Maddie and Max. As we pulled onto the grounds of Cairnwood Estates, we were in awe. Created as an elegant sanctuary and private estate for 19th Century industrialist John Pitcairn; Cairnwood is an architectural masterpiece from the Gilded Age complete with lush gardens and grounds. We started in the Bridal Suite where Maddie, her mom and bridesmaids were getting ready. The team from Daneene Jensen and Associates was busily working on hair and makeup, so we grabbed Maddie’s gown and went to explore the mansion. Each room was unique, boasting incredible historic detail. There were so many areas that I couldn’t wait to shoot. After finishing up details, we asked Maddie’s mom and bridesmaids to get dressed. The bridesmaids wore striking red gowns and her mother looked just as great in her navy, lace gown. Next Maddie got into her gown and everyone lit up. She looked stunning! 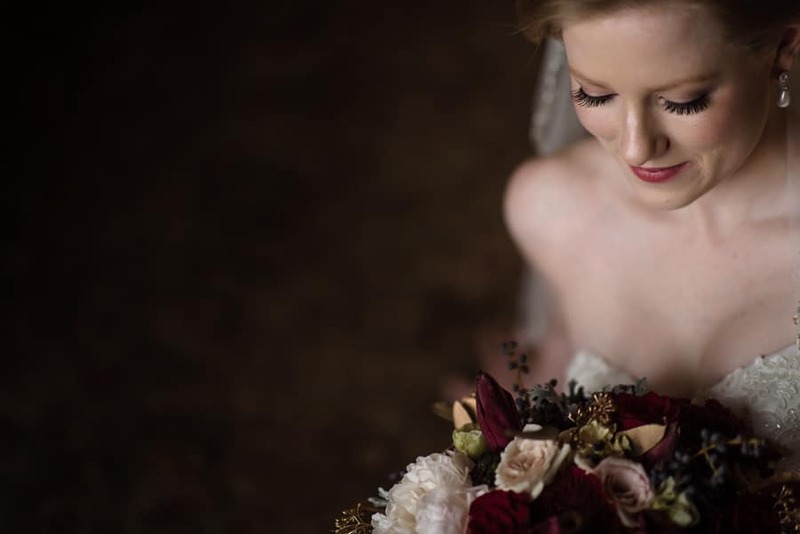 We grabbed her bouquet from An Enchanted Florist and took her for a walk for portraits. One of my favorite spots was the landing of the grand staircase where the window seat overlooks the grounds. 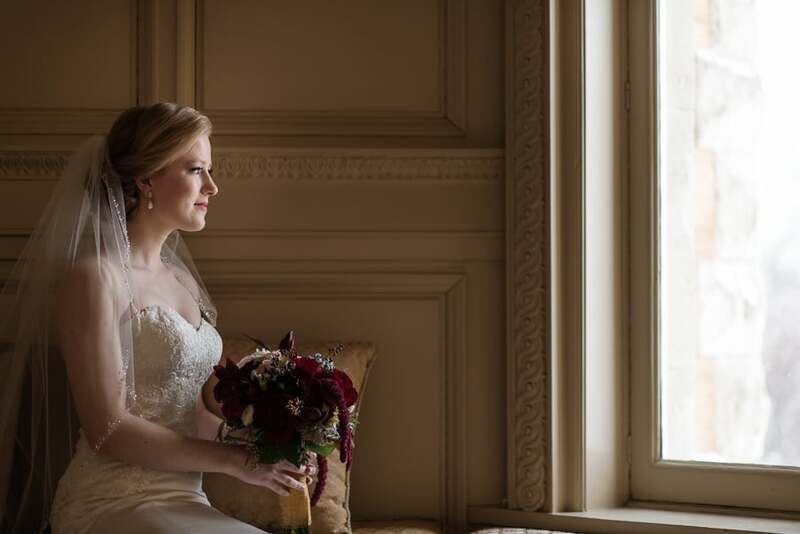 The photo of Maddie gazing out that window at the snow-filled grounds is so elegant and classic; I just love it. We then went back out into the snow to meet Max and the guys at the Bryn Athyn Cathedral located just down the road. This building was magnificent. Construction of this masterpiece began in 1913 and lasted for decades. 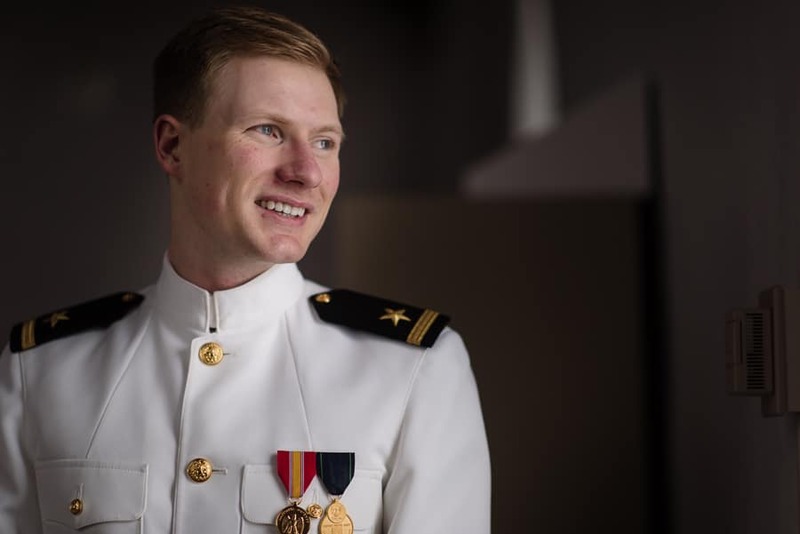 We found Max waiting in the library in his Navy full dress white uniform. 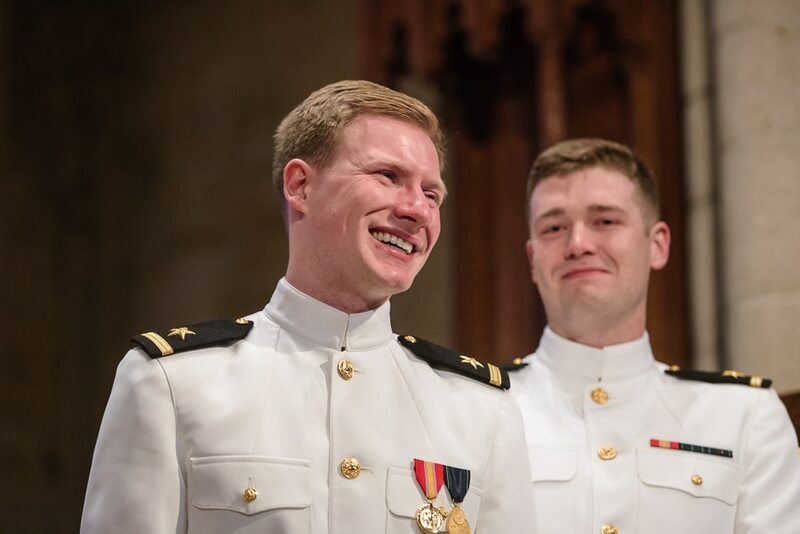 After a few portraits, we went to find his groomsmen and fellow Submariners. We took them outside for a few photos and they only complained a little about the cold. We then went inside to warm up and get ready for the ceremony. 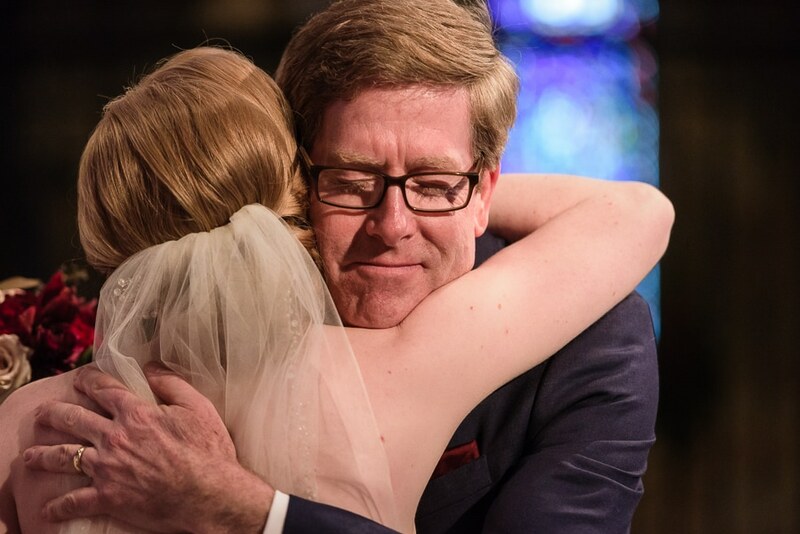 The hand-blown glass windows of the Cathedral looked breath-taking as Maddie’s father walked her down the aisle. 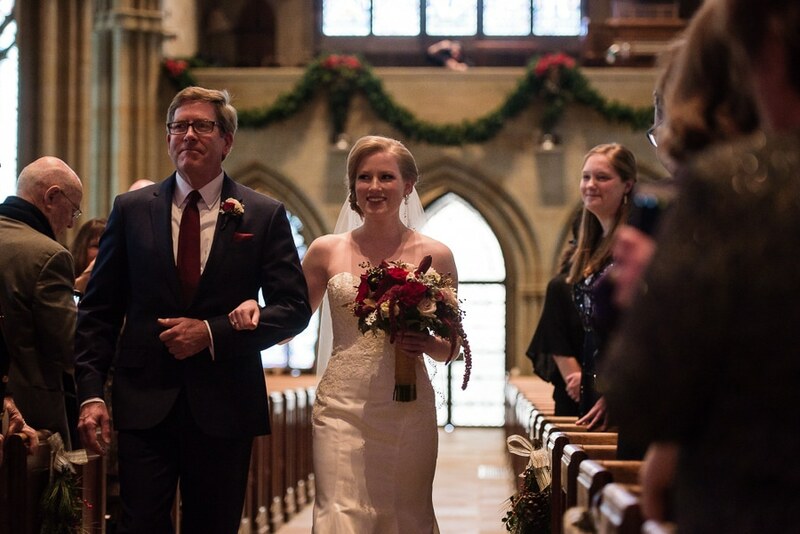 Maddie and Max exchanged vows and a kiss in front of family and friends before heading back down the aisle to sign their names in the Bryn Athyn Cathedral book of records. Next came my favorite part of the day; the Arch of Swords. 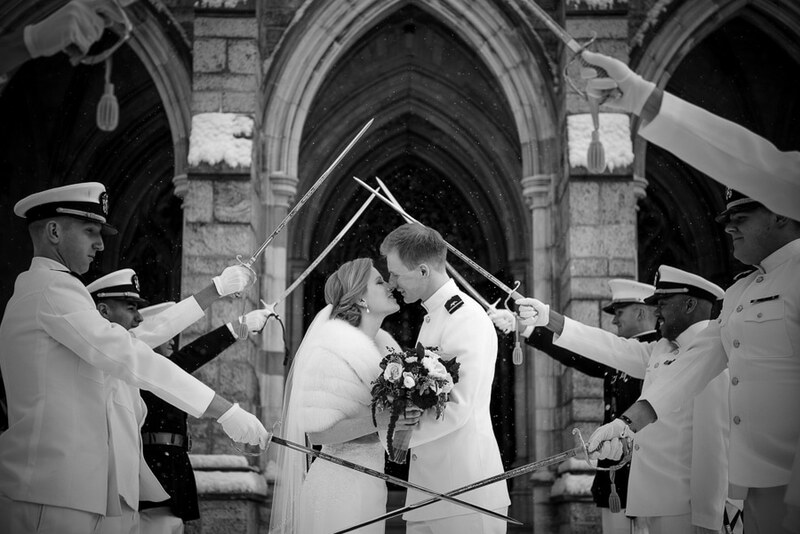 The tradition demonstrates a pledge of fidelity from the military to the new couple. 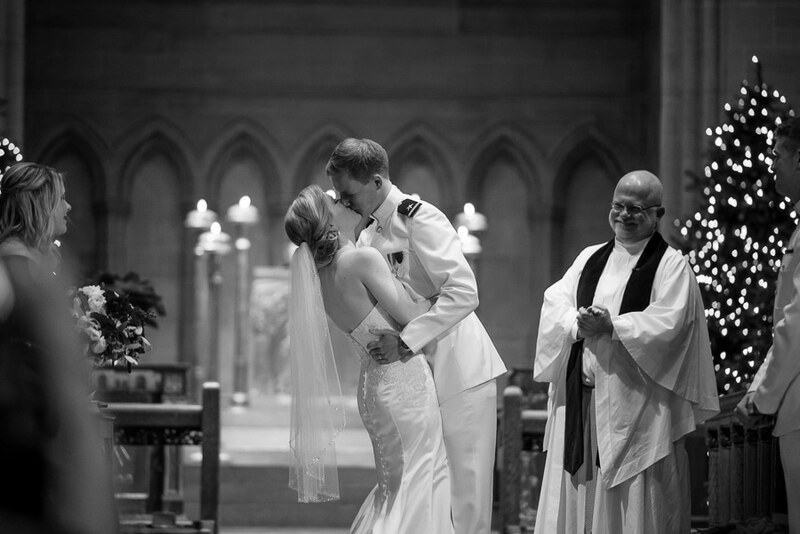 Eight of Max’s fellow service men performed the custom as the couple exited the church. Maddie and Max passed under each arch, but only after following all commands given. 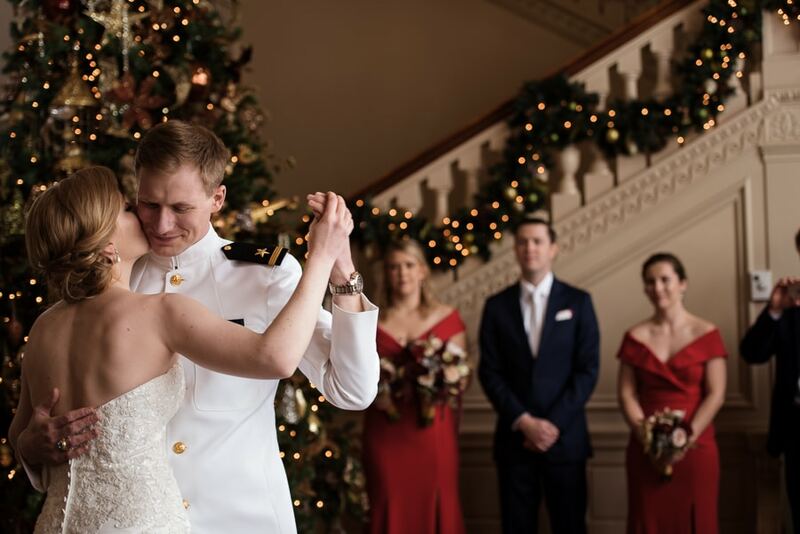 As they reached the end of the Arch of Swords, the last two Submariners announced the couple and welcomed Maddie with a swat on the behind and a “Welcome to the Nuke Navy, ma’am!” Guests then head off to the Cairnwood Estate main house for cocktail hour. The bridal party was happy to endure the cold temperatures for group shots, before we took the newlyweds off for couple portraits. After exploring the Cathedral and its grounds during portraits, we head up to catch the end of cocktail hour. 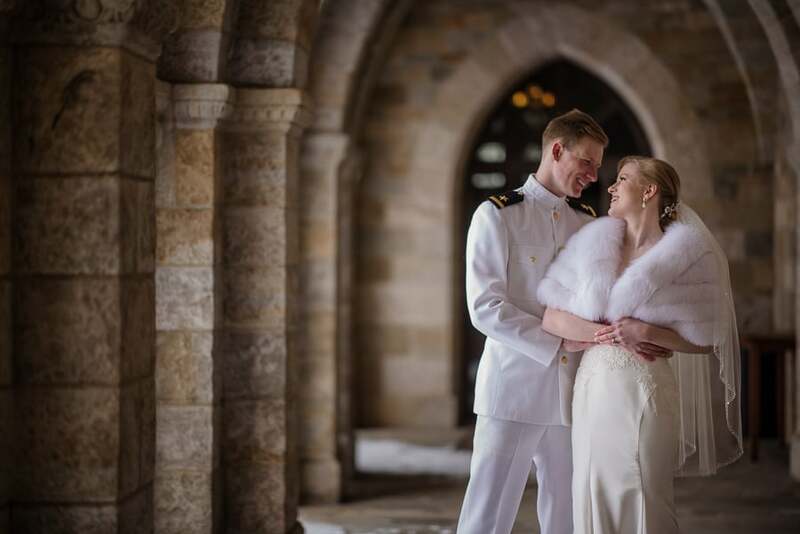 Upon entering the main house and location of the Cairnwood Estate wedding venue, guests were greeted into the great hall with a ceiling two stories high, a massive carved stone fireplace and beautiful holiday décor. Guests enjoyed passed hors’ d’oeuvres from Feastivities and indulged in custom cocktails at the bloody mary and mimosa bars set up in the library. 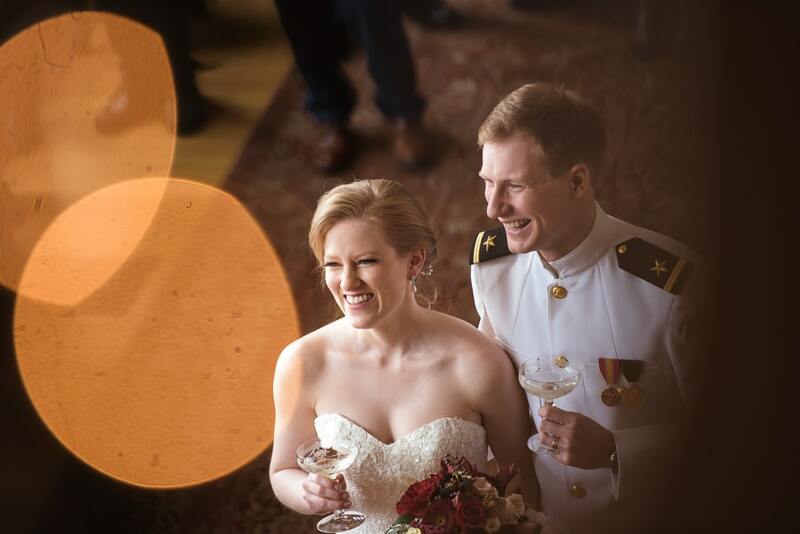 Maddie and Max enjoyed a few moments alone upstairs in the bridal suite when they arrived. When it was time for entrances, Jon and Joel from Jon Ardito Entertainment, brought the parents, bridal party and then the bride and groom down the stately staircase. 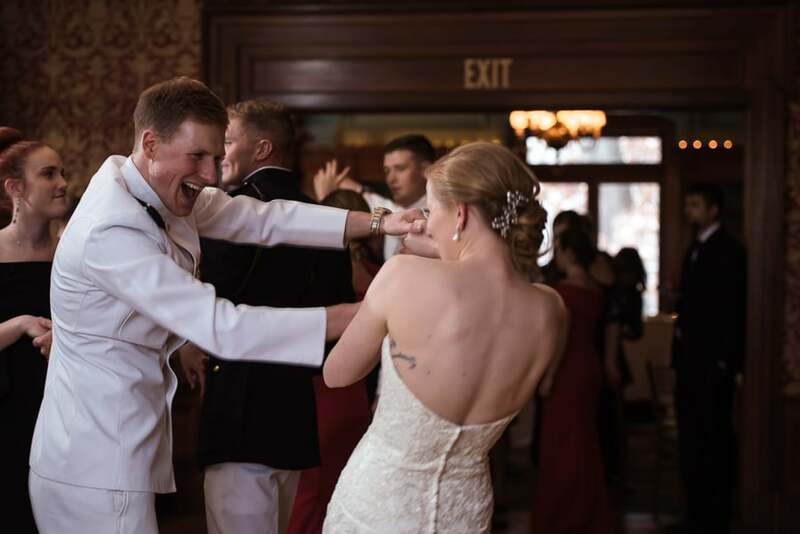 Maddie and Max went right into their first dance to “Lucky” by Jason Mraz. The couple wowed guests with their graceful dance. Maddie’s father welcomed everyone, before handing it over to the maid of honor and best men for toasts. Brunch was then served in the dining and billiard rooms. After the meal, guests were lured back into the living room where the dance floor was ready for action. DJ Joel had a daytime dance party, complete with a little swing dancing, going in no time. Maddie enjoyed a dance with her father and Max one with his mom. 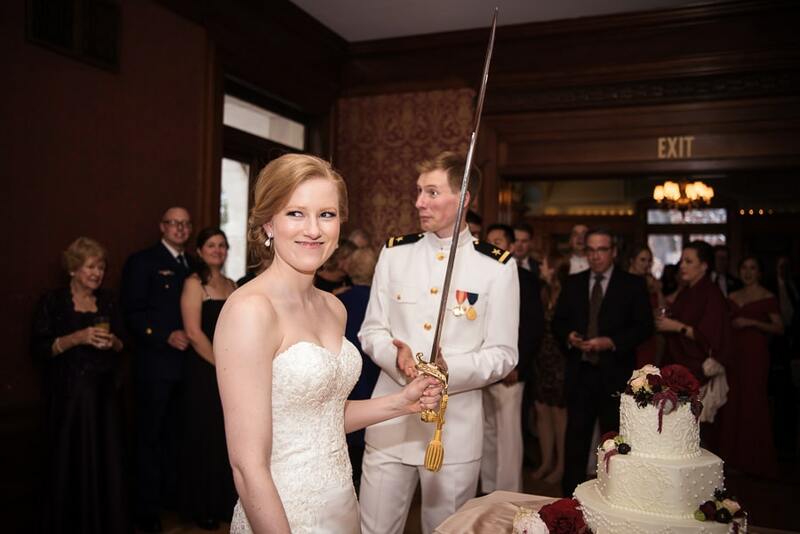 Then the couple enjoyed another military tradition where the bride and groom cut their wedding cake with a ceremonial military sword. Max presented the sword to Maddie and together they cut into the beautiful cake from Bredenbeck’s Bakery. More dancing and merriment endured the rest of the day. Before we left, Maddie and Max were willing to truck through many inches of snow to the front garden to get their photo with the historic Cairnwood Estate behind them. This photo really captures the essence of their day. Please enjoy the highlights and slideshow below.